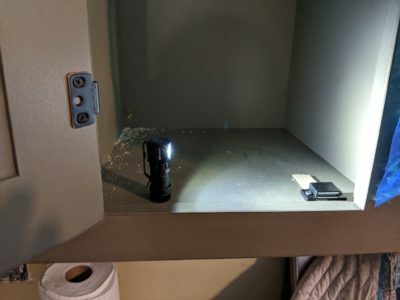 Olight has provided this reviewer with one Olight H1R Nova headlamp for review purposes. Additional information can be obtained directly from Olight at their WEBSITE. My first experience with Olight’s products stemmed from getting involved with the hammock camping community here in the NorthEast. 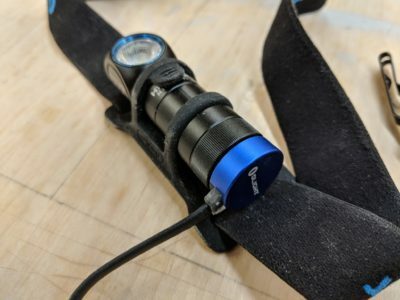 A number of fellow hammock enthusiasts sported these headlamps which reminded me of the military MX991 right angle flashlights I remember using as a kid. Except these Olight headlamps were TINY and super bright!! Purchasing one has been on my list for some time and when given the opportunity to review one I jumped at the chance. 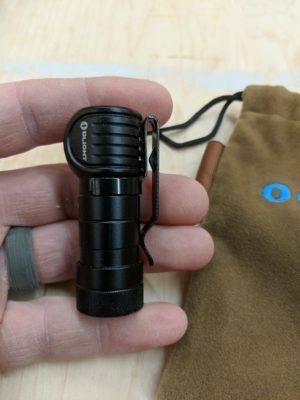 To rewind a little bit, I want to discuss the Olight company itself. 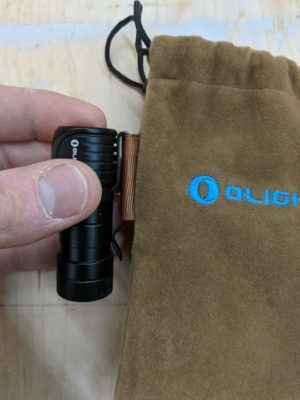 It’s main headquarters and manufacturing are in China but unlike many Chinese companies who are knocking off products designed by others, Olight is a global lighting powerhouse. These are their own designs which are quite high end and priced accordingly. The H1R Nova I am reviewing retails for just south of $70, so NOT a cheap knockoff by any means! Olight has branch offices in Georgia, USA as well as Germany and Australia. 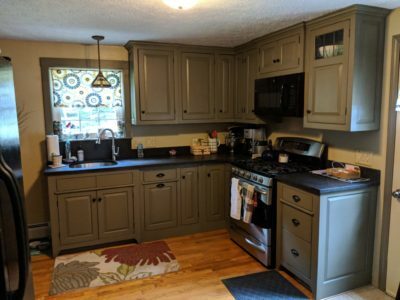 They also back up their products with a 30 Day no questions asked return policy, a 5 year replace or repair plan, as well as an after 5 year support plan. This cements their place in the high end lighting industry as far as I am concerned. Now to really discuss this H1R Nova headlamp. 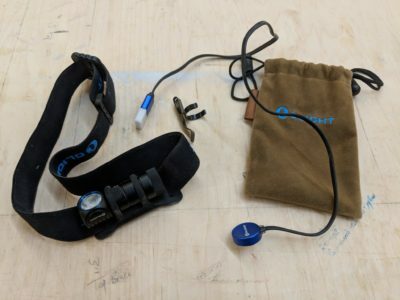 Upon opening the package I noticed very detailed instructions on how to use the headlamp initially, how to charge it, and how to convert it from pocket light to headlamp. Below you will see pictures of how to remove the pocket clip which is quite ingenious. 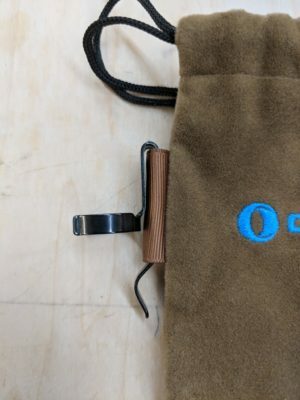 Essentially, on the side of the sack that comes with the lamp, there is a loop of ribbon that you slip the clip in and then pull the clip off the side of the lamp. Very handy feature as the clip is really on there! Once you have removed the clip you just shove the light into the rubber mount on the head band. Everything adjusts easily and the headlamp rotates up and down easily to point it where you want it. 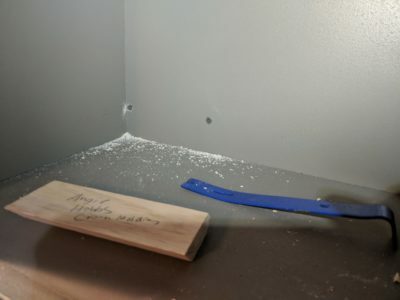 See pictures below of clip removal. 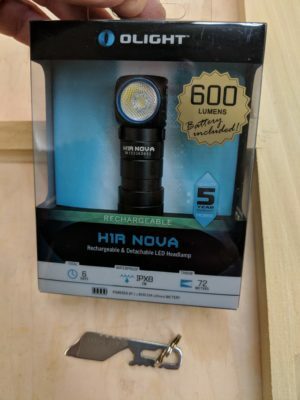 The Olight H1R Nova headlight as I mentioned before is very small! 2 3/8” long to be exact. As the factory specs state, it is rechargeable and they were brilliant in that instead of using some strange proprietary battery to accomplish this, they used the CR123A sized battery form factor and designed an optimized 650MAH battery which comes with the light. What this means is that all my concerns about having a battery are reduced to nothing! They have provided the purchaser with a superb magnetic tail cap USB charger that lights red until the internal battery is charged and then turns green. You just yank it off and go. IF, say on the trail, you run out of battery, you have a number of options. First, you could carry a battery bank to charge the light and any other devices you might need to charge. Second, you could carry a charged up RCR123A Olight battery which are available from them direct. And finally, which is the best thing about this, you can use any CR123A battery you might bring or purchase at most any place that sells batteries! They are very common for cameras and other electronic devices. Olight really did their homework with this one. Now onto the actual usage of the light. 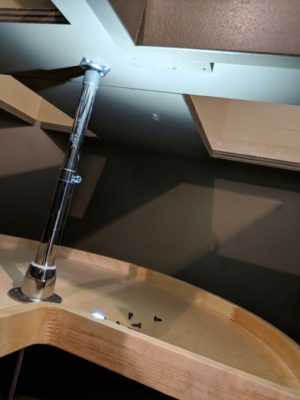 The base as stated above is magnetic for the charger, which also means it sticks to any metal surface such as under the hood of a car so you can use it hands free or in a wood shop on a saw (more to come on this in follow up review). As the directions explained clearly, there are four brightness levels plus Turbo mode. The standard high mode is 180 lumens and is very bright for most uses such as hiking, camping, or indoor use in a power outage. The lower modes are great to conserve power and to read with. The turbo mode is for when you either need to blind someone or you really need to see what is creeping around in the dark! 600 lumens is very bright for such a small package. The user scrolls through all the functions using the button on the end opposite the charging end. An additional feature Olight programmed in for emergencies is if you hit the button three times it goes into an automatic SOS mode. It blinks SOS in the high mode which would be very visible from far away I suspect at night. I of course used the headlamp the first evening I got it outside to check out how it worked. I was very impressed. 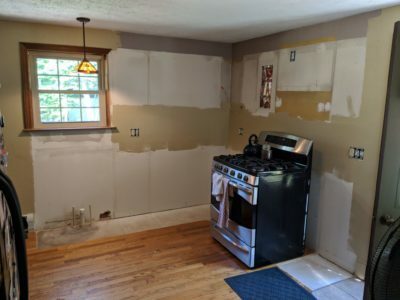 The next day I was beginning a kitchen install and I thought it might come in handy during the install. 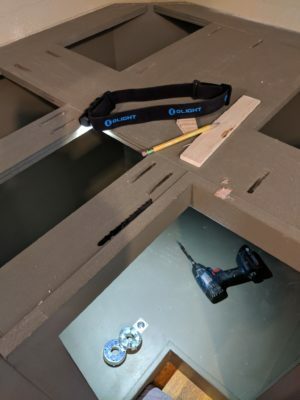 Well I am here to report that I wore and used the H1R Nova headlamp for three days straight on the kitchen install! 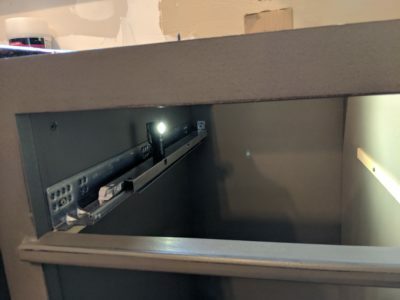 It is very light and you forget it is there until you can’t see inside a cabinet while putting screws in and all of a sudden you light that darkness right up. This headlamp will be going with me whenever I am doing an install for sure. Stay tuned for additional usage, battery life testing, and further thoughts. 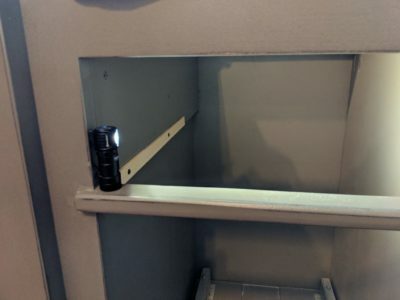 By far the best use, stuck to the first drawer slide lighting up the other side! 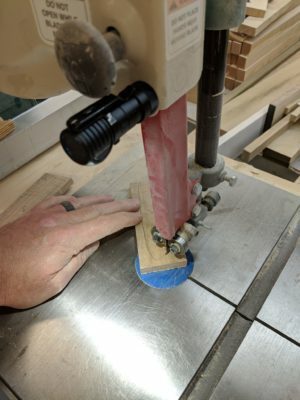 To continue on the workshop usage, I have found the Olight great to have around right in my shop as well! Sometimes you just don’t have light where you need it and with everything being made from metal, the Olight works great. 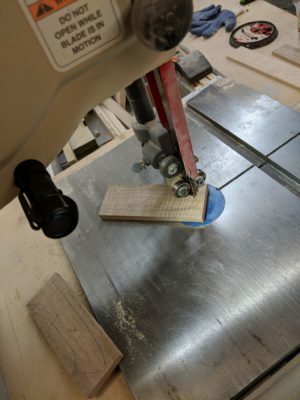 Especially on a bandsaw! Here are a couple positions that worked. The magnet is strong enough that even with machine vibration, the light did not move at all! Regarding battery life, I used the headlamp on that jobsite off and on for 8 hrs each day. I charged at night which took VERY little time to do! Maybe 20 minutes or so? I also have been using the headlamp to head out to my hammock to sleep at night. I slept 18 nights in my hammock during July and normally I have a headlamp and then a regular LED high intensity light to shine around on my way out to check for skunks and whatever other animals might be in the yard. With the Olight I did not need to use that light as on high power, it was just as bright. Once in my hammock I would adjust it down to the lowest setting to read. before I went to sleep. I was going about a week using it every evening before charging it. I feel that even on a backpacking trip, with careful use, you would be pretty set for battery life for a few nights. The beauty of the Olight is that you can purchase additional rechargeable batteries or just grab a CR123A battery in a pinch! One final note is that I would like the pouch it comes with to be just a bit bigger. Once you shove the clip in the there and the cord and then put the headlamp in, it’s a little tight and I worried I would pull the clip out by mistake. Minor design issue though. Certainly nothing I would use to suggest someone not purchase this light.